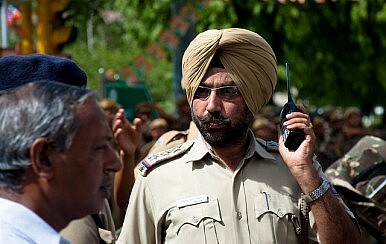 Police in New Delhi say six men believed to be members of the Indian Mujahideen have been detained. Police in Delhi have arrested six men believed responsible for the deadly February 2010 bomb blast at the Germany Bakery in Pune, as well as last year’s terrorist attacks in New Delhi’s Jama Masjid and Bangalore’s Chinnaswamy stadium. The suspects are alleged to belong to the pan-Indian terror outfit the Indian Mujahideen. The Pakistani national, Mohammad Adil, was reportedly arrested in Madhubani, Bihar, and a fake passport has been confiscated. Police identified the others detained as Mohammad Qatal Siddiqui, Goffar Aziz, Gayur Ahmed, Abdul Rehman and Irshad Khan. There are conflicting reports on the names of those detained, with one news agency claiming that two Pakistani nationals are being held. The police have also recovered weapons and cash from the accused, including two AK-47 rifles, a pistol, almost 5 kilograms of explosives, five detonators and forged currency. The police have noted that none of those detained appear to have a criminal background, suggesting IM has shifted its tactics and is recruiting fringe operatives with no criminal record to make detection more difficult. The apparent shift has come as IM looks to have ramped up its activity over the past two years, a revival that caught intelligence agencies off guard after they believed they had broken the back of this homegrown operation in 2008. The lead in the case is said to have been generated a few days ago, when two IM operatives were arrested in Chennai and brought to Delhi for questioning.Delhi police have shared details of the six men with Maharashtra Police and Karnataka Police and requested them to follow-up and make further arrests as necessary. According to a press release from police, Ahmad Siddi Bappa, also known as Imran, is the group’s leader and is believed to have assisted with financing and logistics. A report by IANS suggests he is still at large, and police have released a CCTV grab of him leaving behind a backpack in the German Bakery minutes before it exploded. He is accused of being coordinating with other IM cells and of planting a bomb in a car outside Delhi’s Jama Masjid, which eventually exploded but caused little damage. Seventeen people were killed in the German Bakery attack and dozens more injured. The restaurant is in Pune’s upscale Koregaon Park area. About two months later, two low intensity bombs exploded near a jam-packed Chinnaswamy cricket stadium in Bangalore, injuring 15 people. These blasts took place less than an hour before an Indian Premier League match. On September 19, two Taiwanese tourists were injured when two motorcyclists opened fire outside Delhi’s Jama Masjid, just days ahead of the Commonwealth Games in Delhi. Officials in the Indian security establishment are said to regard the arrests as a major breakthrough in what has become the biggest domestic security headache for the authorities in the past couple of years. Police are hoping that the questioning of the six men will give them a greater insight into the techniques being employed by IM. Indeed, sources suggest that they have already established that IM has several cells operating across the country, sometimes more than one in a city. They also believe that IM is increasingly focusing on recruiting young people with no criminal record.